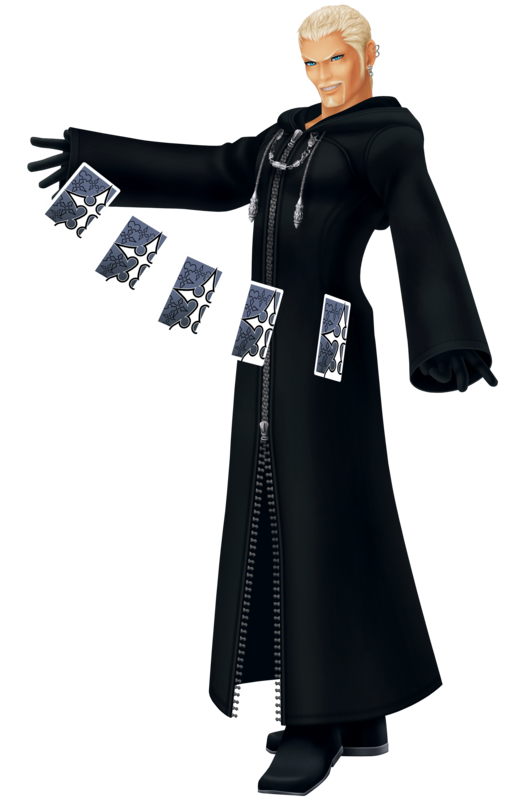 Luxord is Number X of Organization XIII and uses his British charm along with his gambling wit to do over his foes. With his element of time, he makes a strange enemy in battle, solely capable of being defeated if time runs out for him. Luxord's first appearance is like the other remaining members of the Organization at Hollow Bastion where he partakes in the laughing at Xemnas' humor. Unlike Xigbar who stays to taunt Sora, he leaves with his Superior to further the Organization's plans back at The World That Never Was. At Where Nothing Gathers, he discloses his intentions to his Organization mates and tells them he plans to "pass out some cards", meaning he plans to stir things up a bit for Sora and company. Before Sora is due for his second visit to Port Royale, Luxord meddles in the world's affairs by stealing some sacred pirate treasure, causing young pirate Will Turner to investigate him. However, Luxord is only encountered when Sora and Jack Sparrow come to find Will on the Black Pearl; the Nobody reveals he is assessing the pirate gold's worth to the Organization before setting the giant Grim Reaper Heartless on them. Though the Heartless is defeated, Luxord retrieves its heart and teleports away, pleased with his gain. Before Luxord approaches Sora and friends in The Castle That Never Was, he speaks with his remaining Organization members about Axel's actions, claiming Axel gambled with his life - something he never had - and for that he is a cheater, but Luxord isn't put off by it. Instead he proceeds to ambush Sora and his friends at his personal lair, where he corners Sora into a time-based battle. Though this is different from the rest of the battles, Sora masters the game quite quickly and promptly ends Luxord. A skilled card-player, master of rhetoric, and number X in the Organization, Luxord views life itself as a game to be played - one which he knows the rules of by heart (figuratively speaking). Always smooth, calm, and collected, he possesses a strange sort of gambler's intuition, leaving matters up to pure chance, with the confidence that he will be the victor. Unlike many of the other members who accompany Roxas in the field, he rarely belittles the naïve Keybearer, choosing instead to treat him with the respect of one member to another. If ever he sees the need to prove himself superior, he mostly does so without putting Roxas down in the process. If not an ally of Roxas, he certainly isn't his enemy. He accompanies the thirteenth member primarily in Wonderland, an apt world for somebody who fights using a deck of cards. Nudging Roxas along every now and then, he uses his wit to unravel the riddles of the Cheshire Cat, while creating some mayhem amidst the ranks of the Queen of Hearts' soldiers. Be ready for an interesting ride through Wonderland when Luxord is at your side. Luxord's confidence in the throes of chance is more than evident during combat, as he brandishes his deck of magically-endowed playing cards, and makes use of them quite well. With the grace of a dancer and the showmanship of a magician, Luxord effortlessly manipulates the cards in ways impossible to any but him; they shred enemies in funnel-like vortexes, slap them back with surprising force, and even enlarge themselves and move in unison with Luxord's movements, creating devastating results. Even though these attacks aren't remarkably strong, they have a wide range and affect a large radius, making Luxord adept at crowd control. His Limit Break, Jackpot, incorporates the Gambler of Fate's love for games of chance, as a single enlarged card rapidly switches symbols on its face. If receiving an "X," Luxord is merely stunned by a harmless blast, but if he receives a circle or heart, enemies are assaulted by blast after blast of powerful magic.